This web site is of interest to me and many of our customers and potential customers because the SA of your EDS detector is a measure of its efficiency in detecting X-rays. A large SA detector will provide a higher detection rate of X-rays than a smaller SA detector. Historically, the SA of a detector was approximated by the simplistic equation SA = A / d2 where A is the active area of the detector and d is the detector to sample distance. For small detectors at large distances, this approximation is quite good. However, for large area detectors (which are currently quite popular) and for most TEM applications (which use very short values for d), this simple equation is not valid. This web site is very useful because it provides a much more accurate calculation for the solid angle for any detector size and position. In addition, it can accurately predict values when the additional geometric complication of an off-axis detector is required. I will use this web site to compare a few representative geometries of SA calculations for round EDS detectors. The web site also has the capability of calculating the SA for rectangular and annular detectors, but I will leave those examples for the user. In the first example, a typical SEM geometry will be examined where 10 mm2 and 30 mm2 detectors are compared. Most designs for these detectors have the same d, for instance 45 mm in this example. Using these values, simplistic and calculated SA values can be found. In this example, both SA methods provide the same values. There is no primary benefit to using the calculation method. The next example is for a TEM geometry for 10 mm2 and 30 mm2 detectors are compared. 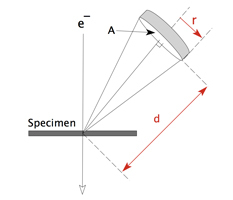 The primary differences to the SEM example are that (1) d=10 which is significantly shorter than for the SEM geometry, and (2) the axis of the detector does not point to the sample. This geometry is very typical for TEM that have a side entry mount location. 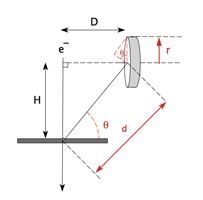 In addition, this geometry also needs a take-off angle, for which 20 degrees is used. In this example, the simple SA method over estimates the true SA values by 7% and 13% for the 2 detectors. SA values for TEM geometries should not be reported using the simple method but should always use the more accurate calculated method. A final example shows a practical application of the SA calculations in comparing potential EDS detector geometries. When comparing detectors and considering SA values, the A is not always the primary consideration for the efficiency because the d term can have a significant effect. This usually occurs when the tubing for the detectors is not the same and the d must increase for a fatter mounting tube to avoid hitting any item with in the SEM chamber, usually the pole piece. This example compares a 60 mm2 in a small diameter tube mounted at 40 mm and an 80 mm2 detector in a larger diameter tube that must be mounted at a larger d of 50 mm. Firstly, the values provided by the 2 calculation methods are essentially the same (within round-off errors) for both detectors. Intuition would indicate that the larger 80 mm2 detector should provide the greater SA value. However, the increased d actually reduces its SA value to less than that for the smaller 60 mm2 detector. Solid angle values for EDS detectors are an indication of the X-ray detection efficiency of the system. A web site is available to calculate the values very accurately once the detector geometry is defined. Comparisons of detector geometry can aid a customer in selecting the best detector for their application.